IT is a mystery that has baffled geologists and historians for centuries… how were the Stonehenge rocks transported from Wales’ Preseli mountains to their resting place 120 miles away. Scientists are today one step closer to solving the 4,000-year- old mystery after making their most significant discovery in 15 years. Of the six to eight different bluestone types found in the inner circle of rocks on Salisbury Plain, only one, the so- called “spotted dolerite”, was convincingly traced to the Mynydd Preseli area in north Pembrokeshire in the early 1920s. But modern technology has now assisted geologists at Amgueddfa Cymru – National Museum Wales – in creating a “fingerprint” for one of the other rock types found in Wiltshire. And that “fingerprint” has been identically matched to stones found in an area north of the Mynydd Preseli range, in the vicinity of Pont Saeson. The discovery means archaeologists are now a step closer to retracing the footsteps of Neolithic engineers who moved the stones in the first place. 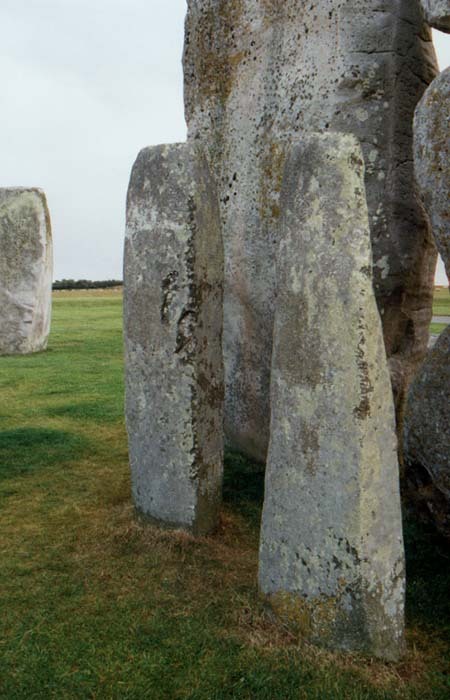 Dr Richard Bevins, Keeper of Geology at Amgueddfa Cymru, said: “The outer circle of Stonehenge is made up from stones sourced locally in Salisbury Plain but it is the mismatch of rocks found in the inner circle that have caused so much mystery. Dr Bevins added: “Theoretically if we could trace the source of the other rhyolites (rock types) we could create a map with six or more locations pinpointing where each stone was sourced. “Archeologists could then essentially see the route that was taken by these people, they could re-trace those steps, set up archaeological digs and make who knows how many new discoveries. Dr Bevins, in partnership with Dr Rob Ixer at the University of Leicester and Dr Nick Pearce of Aberystwyth University, made the discovery by analysing microscopic crystals found in the rock, vaporising them and analysing the gases found as a result. The composite of gases makes up the rock’s DNA which can then be matched to other rock forms. Sourcing the rhyolites also provides the opportunity for new thoughts on how the stones might have been transported to the Stonehenge area. Much of the archaeology in recent years has been based on the assumption that Neolithic Age man had a reason to transport bluestones all the way from West Wales to Stonehenge and the technical capacity to do it. Dr Bevins said: “It has been argued that humans transported the spotted dolerites from the high ground of Mynydd Preseli down to the coast at Milford Haven and then rafted them up the Bristol Channel and River Avon to the Stonehenge area. “However, the outcome of our research questions that route, as it is unlikely that they would have transported the Pont Saeson stones up slopes and over Mynydd Preseli to Milford Haven, we would assume that they would not carry the rocks up and over a steep mountain range. Some believe that the stones were transported by the actions of glacier sheets during the last glaciation and so the Pont Season discovery will need appraising in the context of this hypothesis. Mike Parker Pearson, Professor of Archaeology at Sheffield University, added: “This is a hugely significant discovery which will fascinate everyone interested in Stonehenge. “It forces us to re-think the route taken by the bluestones to Stonehenge and opens up the possibility of finding many of the quarries from which they came. New research has cast fresh doubt on the journey which the Stonehenge Bluestones took from Pembrokeshire to the site of the pagan monument. Since the 1920s, geologists have strongly suspected that the ‘spotted dolerite’ Bluestones, which form Stonehenge’s inner ring, originated from Mynydd Preseli in the north of the county. However, whilst the new findings have also linked a second type of stone – rhyolites – to the area, they call into question how the stones arrived in Wiltshire. Perceived wisdom had it that Stone Age man transported the giant slabs via raft, up the Bristol Channel and River Avon. But as Pont Saeson, the location of the new match, is to the north of the Preselis, some believe its unlikely that they would have been able to navigate the terrain in order to get the enormous rocks to the coast. An alternative theory was that nature drove the stone to Stonehenge, in the path of an Ice Age glacier, although the absence of any other Welsh rock in the region seemed to have ruled out the possibility. Yet Dr Richard Bevins, a geology expert from the museum which collaborated in the research by Aberystwyth and Sheffield Universities, believes it may now be time to revisit the idea. “Matching up the rock from Stonehenge with a rock outcrop in Pembrokeshire has been a bit like looking for a needle in a haystack, but I’ve looked at many if not most outcrops in the Mynydd Preseli area. “We are however, confident that we have found the source of one of the rhyolites from Stonehenge because we’ve been able to make the match on a range of features not just a single characteristic. Now we are looking for the sources of the other Stonehenge volcanic and sandstone rocks”. Dr Bevins’ team are able to say so categorically that they’ve discovered the source of the rhyolites, thanks to a range of laser mass spectrometry techniques, which analyse both the chemical composition of the rock and the micro-biology present when it was formed. The combination of the two provides an almost unique signature for rocks only found in the Pont Saeson area. But the new match does explain the absence of any other Welsh Bluestone in the Stonehenge area, if indeed glaciation was responsible for carrying them there. Prof Mike Parker Pearson, from Sheffield University, called it a “a hugely significant discovery which will fascinate everyone interested in Stonehenge”.